As Canadians know, Canada is a massive country, not just east-west, but also north-south. 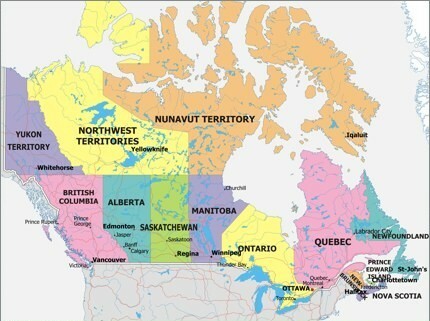 To our non-Canadian friends, you need to think of a province as you would a state. For the sake of Americans reading this, I’m using miles below instead of kilometres. 1 mile = 1.609344 kilometres. Western Canada (British Columbia, Manitoba, Saskatchewan and Alberta). Central Canada (Ontario and Quebec). Eastern Canada (Nova Scotia, New Brunswick, Prince Edward Island and Newfoundland). To give you a sense of how close Montreal and Toronto are, it would take you about 6 hours to drive from one to the other – about 340 miles. If I wanted to drive from Toronto to Winnipeg it would take me about 24 hours to do it, almost 1400 miles to drive. It would take you 13 hours to drive to Calgary from Winnipeg as they are over 800 miles apart. New York and Chicago are about 13 hours driving apart – almost 800 miles. It would take someone in Toronto over 35 hours of non-stop driving to go the over 2100 miles to Calgary. Vancouver and Calgary are almost 12 hours driving apart – a little over 600 miles.